Throughout the year, tasting events are held at Crates. 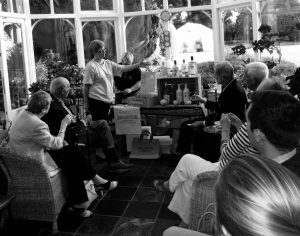 You will get to try at least 10 spirits – mainly local gins but other spirits too and we usually finish with a G&T or cocktail. Nibbles will also be served. BOOK quickly as places sell out and places are limited. £30 per person or £25 for Gin Club members. NEXT EVENT: Wednesday 22nd August 2018, 6pm – 8pm at Crates Local. 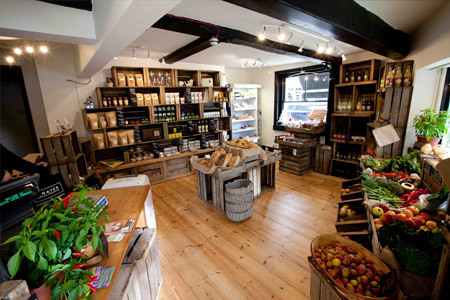 The Ginsters at Crates can be booked to provide very unique local Gin & Spirits Tastings at your own venue or you can even book Crates itself for your private event. You and your guests will be offered at least 10 spirits, mainly local gins but other spirits too and we usually finish with a G&T or cocktail. You can even book the Ginsters to stay onto provide your own gin bar. Proposed date & time of event – address of your venue (or Crates) – number of guests. The Ginsters will get back to you as soon as they can. The Crates Mobile bar is totally self contained. The Ginsters can set up in your lounge, hall, barn, shed or how about poolside? 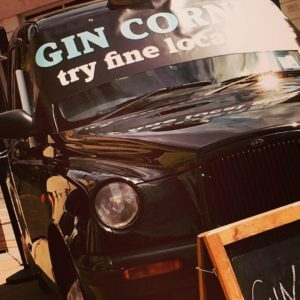 If you have accessible outdoor space, Crates also has a unique Gin Taxi they can bring along to make it a real spectacle. Proposed date & time of event – address of your venue – type of venue (inside – outside etc) – number of guests. The Ginsters will get back to you as soon as they can.